I like to think I’m not your stereotypical harpist. I love it when people come up to me and exclaim, “Wow! 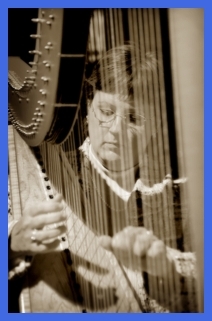 I didn’t know you could do that on a harp!” Fast and funky Celtic with a slap bass, sultry Latin rhythms, romantic classical, jammin’ rock’n’roll, contemporary pieces from the radio, Broadway standards, movie themes... the more styles the better, and my favorites are the ones you don’t hear every day. My style is sassy and unorthodox; my philosophy is that if you’re not having fun, you’re doing it wrong! How did I develop this unusual approach? Probably because I didn’t become a harpist via the usual channels. There’s a lot of creative freedom in coming at something from an unexpected direction. Growing up I lived in England, Singapore, and Upstate New York, but spent most of my life up until college near London, England, playing piano practically since birth and surrounded by the omnipresent Celtic music and history of the UK. There were harps everywhere, I just didn’t own one! I studied music from the time I was very small and continued with piano through to adulthood, playing both as a soloist and with a variety of choral groups. I learned to play by ear as well as reading music, and to this day I’m fortunate enough to be able to play many things by ear and develop arrangements on the spot. I also developed a passion for writing and arranging my own tunes. My interests didn’t lie solely in music, however. Owning a horse and competing with him across the south of England taught me to be reasonably fearless, which is apparently a requirement for taking up the harp later on in life. (It’s not the “done” thing!) I came to Rochester, New York to pursue my degree in Medical Illustration from The Rochester Institute of Technology. After graduation I began a career in medical art, advertising design and graphics, working for several large public relations/ad firms and illustrating many books and projects. I kept active with piano the whole time, but I really wanted to... play the harp. 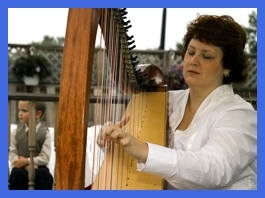 I married my husband, Bob, and after my first child was born, I convinced him to let me have a bash at it (the harp, not the child). How did I do it? I threatened to teach myself the bagpipes if he said No. (Shocking how fast the harp was delivered. Feel free to try this with your own spouse.) It was an instant and easy transition for me, and soon harp took front and center as performances started presenting themselves. I now credit Bob with being a Great Patron of the Arts for taking that risk all those years ago! 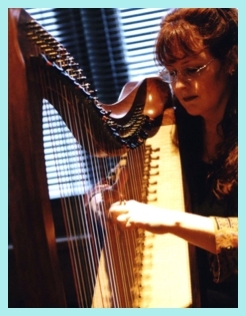 Now I play harp all over Central and Western New York on both Concert Grand pedal harp and Celtic lever harp. 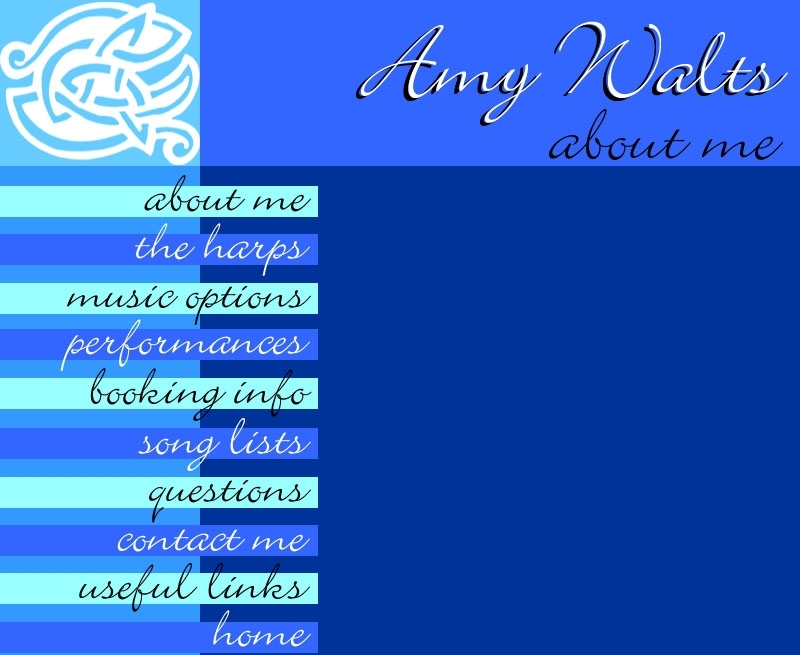 I do all kinds of events: weddings, cocktail & dinner hours, corporate events, private parties, restaurant work, hospital work (as an MHTP-Certified Music Practitioner), solo concerts, chamber music, and more. I am on the preferred performer lists for many of the area’s top-notch resorts, hotels, wedding destinations, and elite clients, playing more than a hundred events and concerts each year. I’m still active as an illustrator and designer, and I often teach in the College of Fine Arts at The Rochester Institute of Technology, mostly working with future medical illustrators and graphic designers. Over the years, I’ve worn a lot of hats: horseback riding instructor, New York State Emergency Medical Technician, medical illustrator, art director, pianist, harpist, wife, mother, and teacher. And each those those things has brought something to the music. 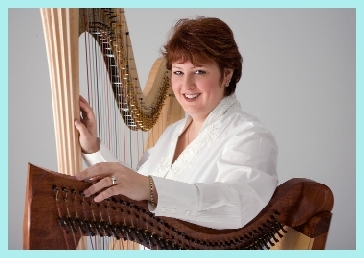 Bob and I have three children and several dogs, all of whom are great fans of harp music.